In late November 1999, ministers of the World Trade Organization (WTO) gathered at the Washington State Convention and Trade Center in Seattle to kick-off a new series of trade negotiations. To many, the WTO’s policies seemed to increasingly favor multinational, corporate interests at the expense of the world’s poorest nations, the environment, small farmers and working people. Recognizing the WTO’s Seattle meeting as an important opportunity to draw attention to those concerns of globalization, more than 40,000 people gathered as part of a street protest outside of the Convention Center. At the time, it was the largest demonstration ever against the WTO and the allied International Monetary Fund. On the first day, the protests shut down the WTO meeting as tens of thousands of people filled the streets, blocked access to the Trade Center and resulted in the cancellation of the first day of the meeting. In response, local officials declared a state of emergency, imposed a curfew on the city and established a 50-block “no protest zone.” Officers began visually profiling anyone in the immediate area, which included the city’s financial district, and arrested and jailed hundreds of people, including peaceful protestors exercising their First Amendment rights in Westlake Park. The protestors were kept imprisoned until the protests ended—but all charges were eventually dismissed. 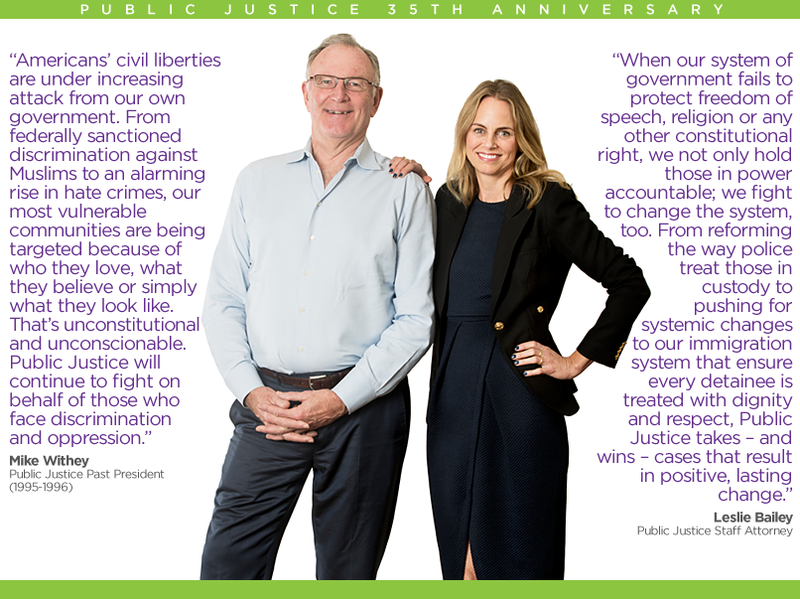 Public Justice responded, along with Past President and Seattle Attorney Mike Withey and a trial team including Tyler Weaver of Hagens Berman, Fred Diamondstone and Public Justice Staff Attorney Leslie Bailey, filing suit on behalf of the protestors, claiming the City had wrongly arrested them and violated their constitutional rights. In a trial later depicted in the film Battle in Seattle, a federal jury sided with the protestors and found the city had violated the citizens’ Fourth Amendment rights against search and seizure. After the verdict, which was covered in over 350 newspapers around the world, the parties reached a $1 million settlement that included the expungement of police records and changes in police training procedures for mass protests. Today, Public Justice continues our advocacy to defend the constitutional rights of those who are targeted by government officials. Earlier this year, we joined the fight against President Trump’s executive order targeting immigrants and refugees from seven majority-Muslim countries, asking the courts to rule that those who were targeted as a group by the White House’s order be allowed to challenge it as a group, too. And in 2008, we represented the family of Francisco Castaneda, an immigrant detainee who died after immigration officials refused to give Castaneda proper medical treatment in a case that resulted in widespread changes to the U.S. detention system.